Our Company-Wide Inventory Reduction and Optimization program is action oriented. This is not just training, it is a program aimed at delivering a specific outcome: an operationally sustainable inventory reduction. The Company-Wide Inventory Reduction and Optimization program is run solely for your company and it delivers superior results because it involves your team learning new skills and taking ownership of the actions. Download a copy of our Roadmap for Spare Parts Inventory Optimization Success. In addition we conduct a pre-training review for each location and establish a baseline for future measurement. Step 2. Policy Development: Following the training portion of the program a sub-set of your team develops guidelines and policies to help ‘future proof‘ your inventory decision making. This achieved through undertaking our Spare Parts Policy Development (IL03) course and modifying our policy templates to suit your organization. Together, we then develop those guidelines into draft policies for your leadership approval. Step 3. Application and Active Support: Following the training, your team then applies the ICR® process to your inventory with our supervision. For each location involved in the program we provide active support in the effective execution of the process, including reviews of data and 3-5 progress review meetings. This is where your team makes major inroads into achieving the target inventory reduction. Typically this step involves 12 weeks of post-training implementation support. During the program there is monthly reporting, feedback on progress, and each team member has access to the online resources at SparePartsKnowHow.com. This hands-on approach ensures that your team ‘owns the outcomes’ and results in a genuine skills transfer that leaves them with the skills, knowledge, and confidence to continue using the techniques, without further assistance. 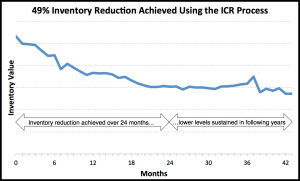 On average, this program achieves a 37% reduction in spare parts inventory. A Company-Wide Inventory Reduction and Optimization Program is typically a 20-26 week project, by the end of which your team will have already achieved significant inventory savings. Please note that this program can be delivered with live in-house training in place of the online training. Contact us to find out more about this service and the applicability to your situation.